It was almost 4:00pm when we left the outskirts of Tsumago by riding down a gentle downhill slope as the vehicle restrictions ended. However, before we could take a breath and take in the countryside scenery, Nakasendo’s route diverted right up a hill into woods of cypress and cedar. The road surface turned into concrete and sloped up harshly making the ride on my foldy challenging. Over 250 m we climbed 35 m then the route leveled off at a junction at the ruin of Tsumago Castle and Shiroyama (castle mountain) teahouse, which is no longer in business. 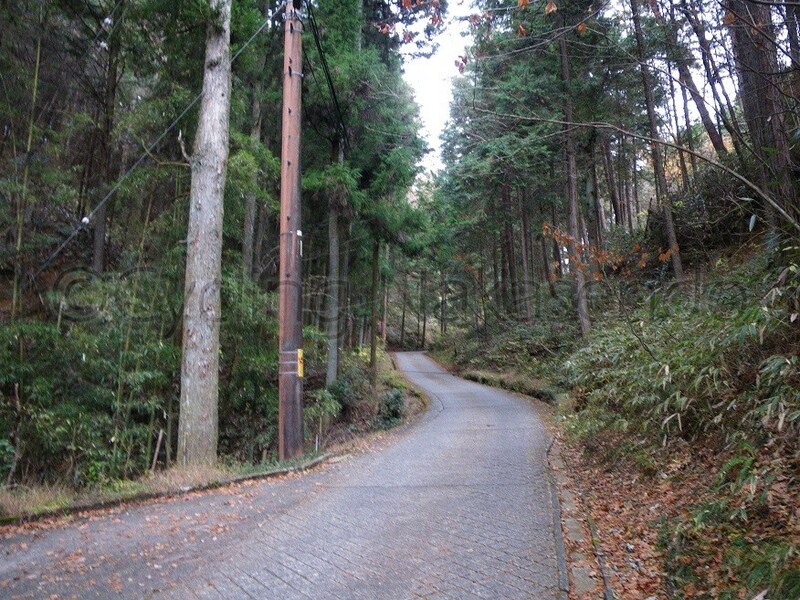 The unsealed Nakasendo remains parallel to a sealed new road for hundreds of meters and then merges with it and continues until hitting an intersection with a stone sign. As the sign indicates, “the old route” (Nakasendo) continues left to descend. We kept going straight on the new route to save as much time as we could. It was a very nice ride on a windy but flat, quiet, single-lane road through woods of evergreens and colored deciduous trees which were aglow with the declining sun. We came out the intersection right in front of a shrine that is dedicated to Kabuto Kannon (deity of mercy in war) of the famous warlord Yoshinaka Kiso (1154-1184). There “the old route” (Nakasendo) merges back with the new route again as it travels uphill from the left to go through the precinct of the shrine where all travelling daimyo (feudal lords) took time to worship for divine protection. Nakasendo continues, slightly uphill through the quiet remote settlement of Goudo, then back in the woods and finally it becomes a very steep downhill path veering to the left. 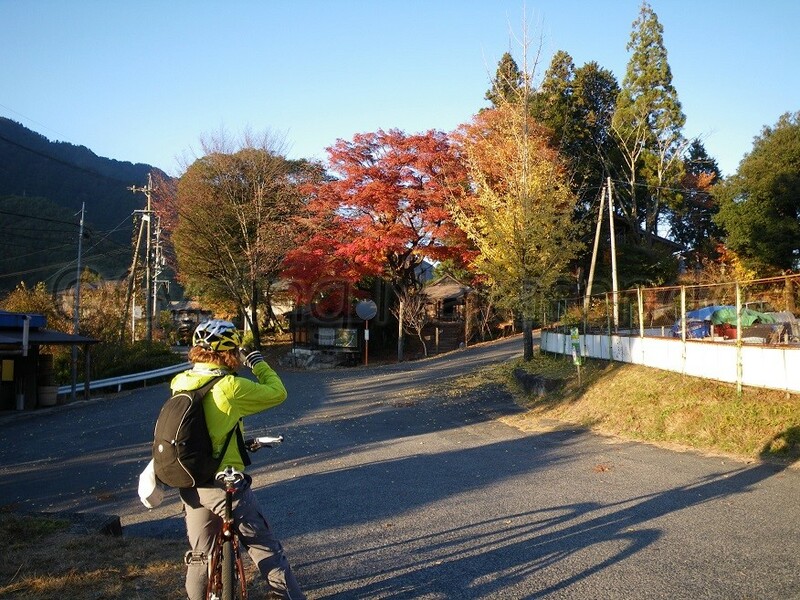 There are two signs, one is pointing out Nakasendo and the other has been placed there by the local PTA (Parent-Teacher Association) and states not to ride down the slope as it is very steep and has a steep turn at the end of a cliff, so I suppose it is dangerous for kids. This section of Nakasendo provided a very good look out over Nagiso town, the Kiso River and the mountains behind it while we traversed down along the slope after the “dangerous” corner. The route turns right at the sign pointing to the next post town, Midono. There is an old steam locomotive displayed here and the traces of a railway track almost at the end of the slope. This was the very first Chuo train line constructed in 1909. 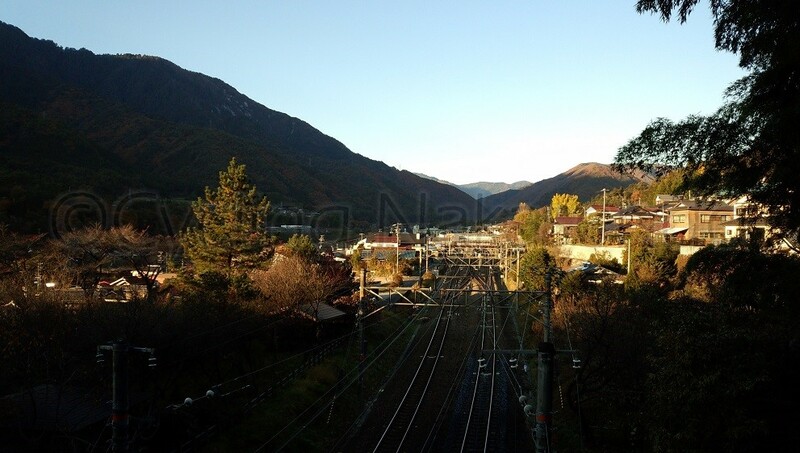 Our route passed over the present day Chuo Main Line to get behind JR Nagiso Station. It continued to run up and down small gentle hills with the refreshing fragrance of cypress hanging in the air. The importance of timber as a local industry is evidenced by the proximity of a timber-yard next to the station facilitating the sale of wood to other areas in the country. This region became famous for producing excellent wood thanks to the strict conservation policy of the past. We stayed on a shorter route, which had a moderately upwards slope. 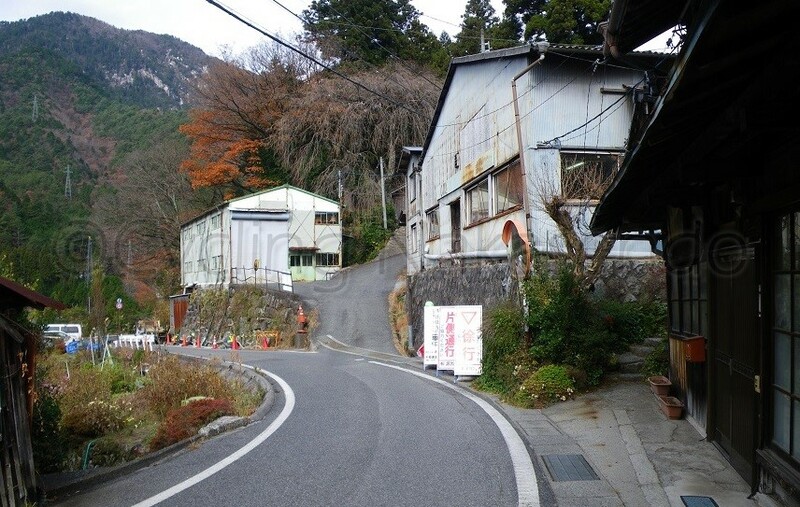 The original route of Nakasendo diverts up into the hills over a newly-built solid concrete bridge and reunites with the newer car-friendly version of Nakasendo we were on at the bottom of Nagiso Primary School’s stone stairs on the outskirts of Midono. As we passed the stairs of the original Nakasendo from the left, which we also avoided, we almost reached the center of the town where the honjin used to be. Every single building from the feudal period in Midono was burnt and lost in 1881 but evidence of the style and traces of traditional building can be seen in old reconstructions of these buildings that still exist today. 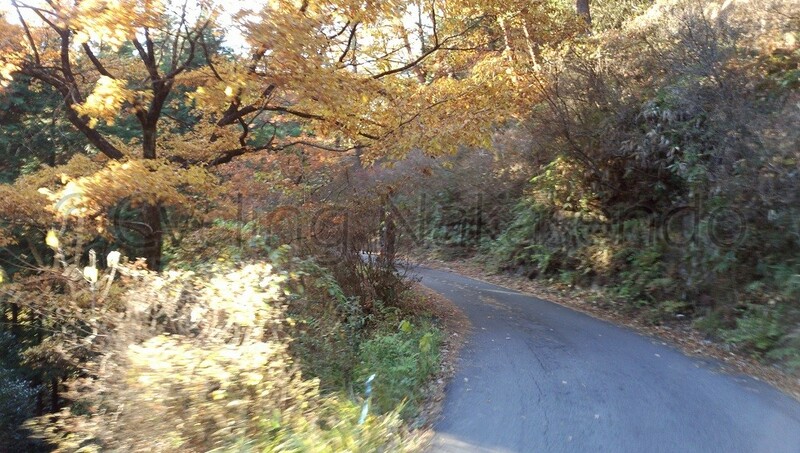 The passage we rode on through Midono turned into a downhill slope as it got close to the Edo-side of the town after which the road forks with one road turning right up a steep hill. 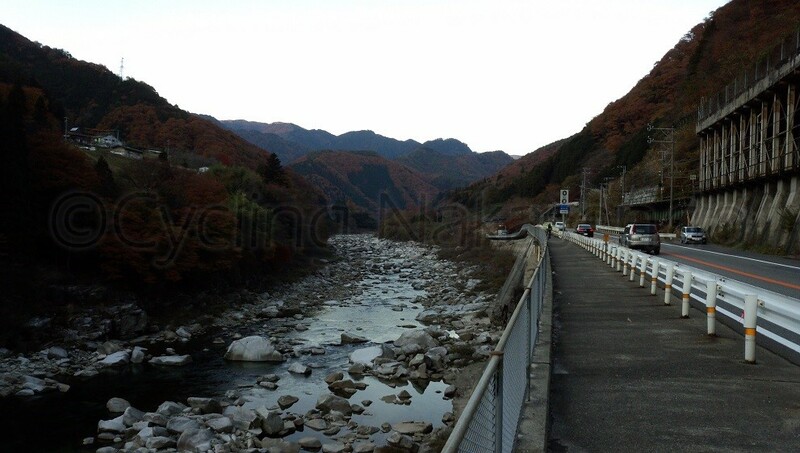 This was used as an alternative road to avoid the section along Kiso River, which was frequently destroyed by flooding. We made a quick descent down the other road, which headed towards the river and crossed Route 19 to get on the sidewalk thus protecting ourselves from the frightening, continuous stream of trucks. The view of Kiso River from Route 19 was impressive. Construction of water dams upstream has limited the volume of water released and now clear water gently flows down the river. However, I could see how difficult it had been to maintain the route along the bank of the river before the dam construction, as the rough gushing water had been able to dislodge and wash massive rocks downstream. Within 3 km on Route 19, Nakasendo diverts left into a side street to pass JR Junikane Station and then merges back with Route 19. To actually travel by bike along the original route of Nakasendo was pretty complicated after Junikane Station. It would have led us through a slightly creepy under-passage that combined with a waterway to cross Route 19. We would then have to go upstream, detour up into the mountains and back downstream to where we would rejoin Route 19 again. We decided to avoid that by continuing on the road we were on, which eventually met with Route 19 and further on, Nakasendo. Nakasendo continues following the Chuo Main Line railway track, crossing over the tracks and back again at several points. To the left of this section of Nakasendo is a reservoir. This section was reasonably flat, a welcome circumstance given the number of uphill sections we had already encountered. As the sun had already set behind the mountains behind us we took advantage of the flat road and happily pushed on hard while some sunlight remained. We kept riding straight ahead and even decided to skip the ride-able original part that I’ve already been on before. 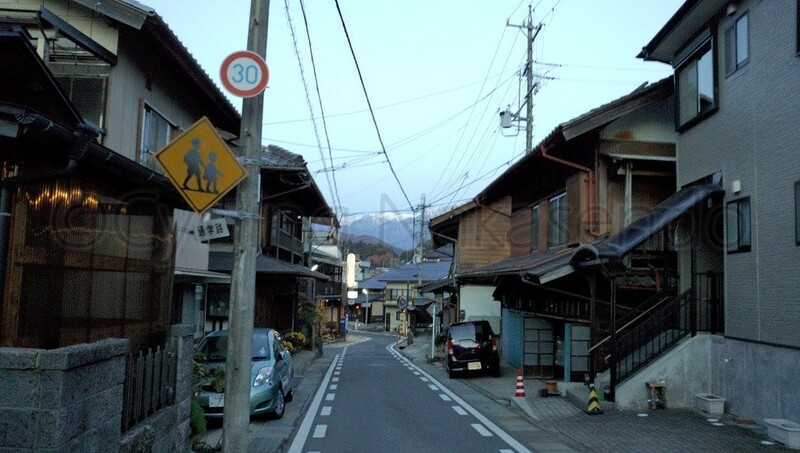 The snow-covered summits of the Central Alps became visible when we approached the residential area near the post town of Nojiri. The streets beyond this point were windy and designed to function as an enemy preventative feature just like masugata. This type of road design is called, nana-magari, literally meaning “seven curves”. While there did not appear to be any inns amongst the collection of old style Japanese buildings and modern structures packed tightly together along the nana-magari, its atmosphere as a post town was preserved by the presence of shops such as a general store and electrical goods store and gave insight into life in this small town. We had a break near the top of the downward slope of Kuran-zaka, near the ruins of Nojiri’s kosatsuba. 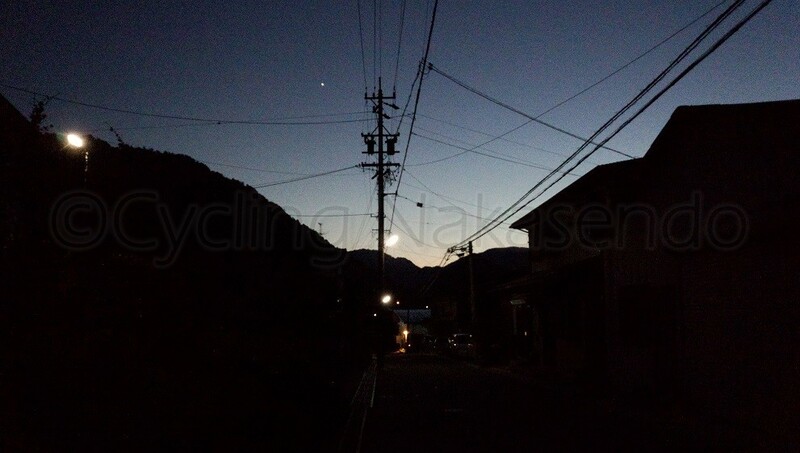 As it was already dark and getting cold we decided it best to only ride 6 km more to Suhara. We ate the rest of the roasted chestnuts NC had bought in Magome while I put head-lights on the bikes. Our bodies must have needed the fuel because they tasted unbelievably good. Apparently bears preparing for hibernation are known to eat chestnuts too. 15 minutes later we were back on our aluminum horses when I heard the strange flabby sound of rubber immediately after we set off … it was a puncture on the back tire on the mountain bike. Of course I had a repair kit and a spare inner tube, but, it was too bothersome for me to fix it in the dark so I thought it would be favorable for us to terminate the day’s cycling and take a train to Kiso-fukushima Station. Luckily or unluckily, it happened within a 10 minute walk from Nojiri Station. I was really surprised when I checked the train time-table when we arrived at the station because the 5:31 pm train was coming in 10 minutes and the one after it was in an hour. What ensued was a whirlwind of tools, bike parts and desperate pulling apart of and repacking of our bikes in the dark into cases so we would be allowed to take them on the train. Normally the mountain bike alone would take 20 minutes to disassemble and pack. I put myself in hyper mode and with the assistance of NC, we did it after which we had to carry the bikes and run over an overpass to a platform on the other side of the tracks. By the time we got on the train we were utterly exhausted. The local train took only 25 minutes and covered the remaining 28 km of the day’s journey. We got off at Kiso-fukushima Station at precisely 6:00pm. Thank god I booked the ryokan right in front of the station, otherwise it would have been hellish torture to carry the bikes while looking for a hotel in an unfamiliar location. The warmly lit Japanese-style entrance of ryokan Yamamizuki URARA Tsutaya was a welcome sight. The ryokan allowed us to keep the packed mountain bikes in their storeroom. The room we stayed in was not big but very cozy. Honestly, at that stage just to have a warm room with a futon to lie on felt like heaven. We went to have our respective baths straight away before eating dinner. The men’s bath was pretty small and filled with heated natural spring water but it was sufficient for a few people to fit in, stretch out, relax and regenerate their bodies. The food was excellent. It was the best Japanese Kaiseki style course dinner I have had along the entire Nakasendo. Kaiseki is a traditional style of course meal, which has evolved from the art of traditional Japanese tea ceremony. The components of Kaiseki are influenced by the seasons and arranged in a way that often has symbolic meaning. I had several more cans of beer in my room after dinner to fill my fuel tank and reward myself after the days ride then promptly fell asleep.